Unless you have LOTS of money, you're probably looking for the best deals, like us! 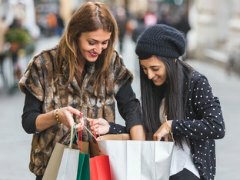 We've listed the shopping centers with the greatest number of brand name merchandise at off-retail prices. This is by no means an extensive list of off-retail and bargain shops in north of the George Bush Tollway, but it'll get you started on your bargain hunting. There's 100 outlet stores here including Last Call by Neiman Marcus, Ann Taylor, Banana Republic, Brooks Brothers, Coach, J. Crew, Kenneth Cole, Lucky Brand, Michael Kors, Polo Ralph Lauren, Steve Madden, True Religion, White House Black Market and more! Homegoods, TJ Maxx and Ross Dress for Less are here as well as numerous upscale stores. There are several shopping centers along Preston, and this is one of the largest. Here you'll find Saks Off 5th, Nordstrom Rack, DSW, Five Below, Half Price Books, Marshalls, Ross Dress For Less, Stein Mart, TJ Maxx (not Homegoods), Tuesday Morning, other retailers and numerous restaurants. Just across Gaylord Parkway facing Preston Road is Sam Moon Trading Company, a beloved local mega discount fashion accessory store (closed Sundays). Last Call by Neiman Marcus, Nordstrom Rack, Stein Mart, Tuesday Morning, and Marshalls as well as restaurants and other stores. While you're in the area, head north on Preston, just across Parker, and look for this store on the east side of the street. This is Neiman Marcus' housewares discount store. There are only two in the U.S.; this one and the one in Grapevine, TX. At the intersection of FM544 and McCreary Road, you'll find bargains galore at Homegoods, TJ Maxx, Ross, and Five Below. Aldi's is right across the street if you'd like to pick up groceries at bargain prices, too. Be sure to visit our calendar for pop-up markets. The monthly outdoor market takes place the Friday/Saturday prior to the third Monday. Actually held the weekend before the third Monday of each month, features 450 vendors. It is said to be the oldest and largest flea market in North Texas going back to the 1870s! Admission is free, but parking is $5 before 3:00 pm.